This week we published an analysis in which we find that Romney’s plan to lower tax rates on corporate and personal income would result in GDP growth of 7.4 percent over the long run (5 to 10 years, with most of that growth happening within 5 years), and an average growth in after-tax personal income of about 10 percent. Tax revenues grow with the economy, such that 60 percent of the $337 static revenue loss would be offset by economic growth, leaving a dynamic revenue loss of $136 billion or about 5 percent of the federal budget. We offer ways in which Romney could close the gap, in a budget-neutral framework rather than the revenue-neutral framework that usually dominates these discussions. Options include a combination of asset sales, reduced spending, and “base broadeners” in the form of tax credits, deductions, etc. However, Romney could close the gap entirely on the revenue side, by eliminating non-investment related tax preferences for high-income earners, which according to the Tax Policy Center is worth about $165 billion. Romney has proposed this week to limit those deductions. On the spending side, we list a number of “corporate welfare” items that we figure could be eliminated without harm to the economy. However, another huge pot of money ($2.3 trillion) is available in the form of transfer payments, i.e. programs like Social Security, Medicare, Medicaid, and unemployment benefits. Empirical analysis by the IMF and others indicates that reduced spending on these programs likely grows the economy. As well, spending on transfer payments would automatically decline if the economy were to return to potential. 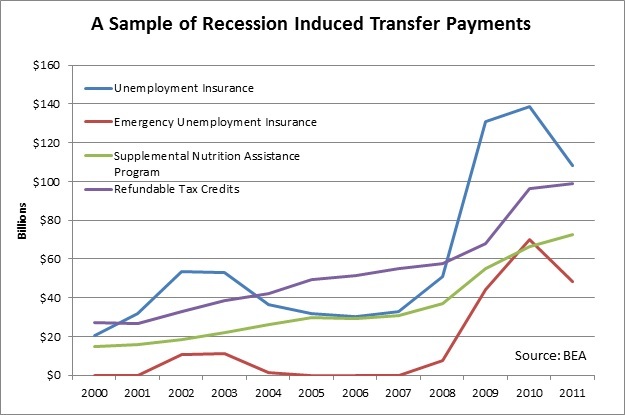 The chart below shows some of these recession induced transfer payments. The big one is unemployment benefits, which peaked at $140 billion in 2010, but could be expected to return to about $30 billion under full employment. That alone would cover $110 billion of Romney’s funding gap. Then there is the Supplemental Nutrition Assistance Program, which could be expected to return to its long run level of about $30 billion, down from $73 billion in 2011. Reduced spending on these two programs alone would produce $153 billion, which is more than enough to cover Romney’s long run funding gap. Reduced spending on refundable tax credits, which mainly target low-income households, could be expected to raise another $50 billion or so. While there would be temporary funding gaps larger than $136 billion, i.e. before the full economic growth effects kick in, there is a multitude of ways to pay for Romney's plan that would do no harm to the economy, as we discuss, either through asset sales, spending reductions, or base broadening.